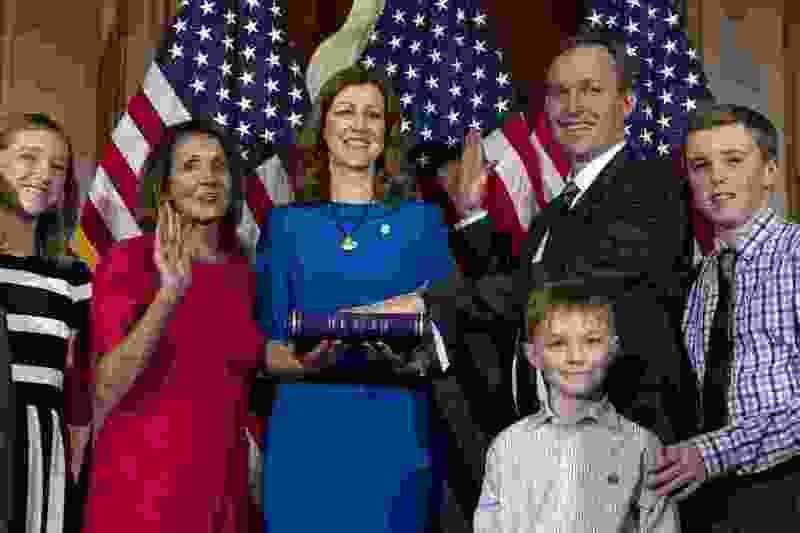 Washington • Utah Rep. Ben McAdams solidified his centrist credentials Thursday, casting his first vote in Congress for Stephanie Murphy of Florida as House speaker, one of 15 Democrats to cast a symbolic vote for new leadership. In his new Capitol office a few hours earlier, McAdams affirmed a promise he made repeatedly during the campaign to vote against California Rep. Nancy Pelosi, who was nominated by Democrats to lead the chamber during the 116th Congress. “I recognize she (Pelosi) has the votes but I’m going to vote for new leadership, recognizing my vote will be more symbolic in nature. I plan to vote for another individual,” McAdams said. He would not say before his roll-call vote whom he would support – suggesting he was still deciding between a few names he had in mind. McAdams, however, singled out Murphy and Derek Kilmer of Washington state as Democrats he admired in the House. Murphy is the leader of the Blue Dog Democrats and Kilmer the leader of the New Democrats – two caucuses that represent the moderate wing of the House Democrats. McAdams has joined both caucuses. Kilmer, he said, has been his mentor throughout the campaign and transition. McAdams said he has also developed “a close relationship” with Murphy. McAdams cast the sole vote for Murphy. Kilmer and Murphy both voted for Pelosi for speaker. Pelosi won the speaker’s gavel, as expected, with 220 votes out of the 430 members present. Some 192 Republicans voted for Rep. Kevin McCarthy. McAdams brought his four children onto the House floor for the afternoon ceremonies, twins James and Kate, 13, Robert, 10, and Isaac, 7. His wife Julie, mother-in-law Chris Judd and close friend Tom Christofferson sat in the gallery. House rules allow for children on the floor but not adult guests. During a lengthy quorum call, McAdams sat with his children toward the back of the floor but did pose with them for a few cellphone photographs. He posted at least one of himself on Twitter standing next to Nevada Rep. Dina Titus as they were sworn into office. His sons, James and Isaac, are with him in the photo. (Peter Urban | Special to The Salt Lake Tribune) Congressman Ben McAdams poses with his family in his new House office. McAdams said it was important to have his family with him for the opening day. “My family has been so supportive of me throughout the campaign this last year, from walking in 17 different parades to sitting around the computer and hitting refresh to watch the votes come in over the two weeks following the election. To have them here, at this moment, as I’m sworn into office really is such a memorable time,” he said. McAdams says his family will remain in Utah for the most part while he commutes to Washington when the House is in session. He’s renting a 500-square-foot studio apartment and expects to purchase a few air mattresses to accommodate his children when they do travel to D.C.
“It’s going to look like a bounce house in our apartment,” he joked. The 116th Congress opened at noon and new members remained on the floor for several hours through a lengthy quorum call and the election of the House speaker. They remained in session into the evening. McAdams voted in line with House Democrats to approve re-opening many government agencies closed during the federal government shutdown, now in its second week, and to provide stopgap money for the Department of Homeland Security without giving President Trump funding for a U.S.-Mexico border wall. The funding package passed. The three other House members from Utah — all Republicans — voted against the measures. McAdams says he supports ending the shutdown so that Americans can get the services that they have already paid for. “We’ve got to get the government open again and start getting back to work,” he said. McAdams does not agree with shutting down the government over any single issue. McAdams does agree that Congress needs to secure the border and address its immigration system. (Peter Urban | Special to The Tribune) Rep. Ben McAdams listens to trade lobbyist Claude G. B. Fontheim in the hallway outside his Cannon Building office. McAdams sees himself as a moderate and pragmatist who favors solutions ahead of party – a philosophy he maintained as two-term mayor of Salt Lake County, Utah’s most populous. McAdams held an open house Thursday afternoon at his office suite in the Cannon Building but was only able to get there for a few minutes between House votes. Still, a steady stream of guests stopped by to say hello. The office is on the first floor just down the hall from Rep. Rob Bishop, R-Utah. The first floor Cannon office is mostly empty of decorations save for four scenic watercolors of Utah that hang in the waiting room. McAdams says there will be plenty of time to find wall hangings and he’s hoping to call upon high school artists back in Utah for some contributions. McAdams defeated two-term Rep. Mia Love, R-Utah, by a razor-thin margin in the November election that wasn’t called until two weeks after the voting ended. The 4th Congressional District leans Republican, although McAdams is the second Democrat to be elected there since redistricting in 2011. The first was Jim Matheson. The new congressman is expected to calculate every vote he takes in order to survive a strong Republican challenge in two years. He has the advantage of being the only Utahn in the House majority. Love has not said whether she would seek a rematch in two years. In a bitter concession speech, she lashed out at McAdams — calling him a “wolf in sheep’s clothing” — but also criticized the Republican Party and President Donald Trump for not making blacks and other people of color feel welcome in the GOP. She has missed 83.5 percent of votes in the lame-duck session since the election.